These cross stitch patterns work well for baby afghans (as shown below), where the design is stitched directly onto the afghan. They work equally well stitched onto a center square in a quilt block. overall afghan size - mine was about 42" x 58"
specialized wording - two packages may look identical. One says "Afghan Cloth", the other says "Baby Afghan." Look closer and you'll see that the one entitle "Baby" is half the overall size than the other. Here similar afghans - each one is different in some way, and there are many more to choose from. Don't be surprised after your purchase. I can't stress enough to pay close attention to the specifications listed above. It is important to plan your afghan pattern before you ever pick up your needle. Counted cross stitch is not a difficult craft, but it is exacting. Use the same care when planning an afghan layout. I promise that you will get better results --a more pleasing combination of images and colors--than if you stitch on the fly. Print each design. It helps if they are close to the size you'll be stitching. Spread out my afghan cloth on a clean sheet on the floor. Move the designs around in the squares until you like what you see. NOW get out the paper, draw an afghan grid, and mark which designs go where. I originally thought I'd stitch one heart in every single square. I am glad I went through the steps above. It helped me to see that the afghan would have been too busy - one design fighting with the next. 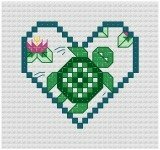 Stitching a heart in alternating squares surrounded each design with the white space it needed to focus on the picture. The afghan patterns shown below may or may not work with the afghan cloth you ultimately choose. But they should give you some ideas on how to start planning your afghan. This first layout looks similar to my first heart cross stitch afghan pattern. The corners display our Goodnight Prayer. The center three blue hearts display the name; the lower heart in the center gives the birth statistics (date, weight, length). The solid hearts surrounding the center were actually stitched with variegated floss, shading from dark to light. Solid hearts work as well. The top center heart contained the picture heart entitled "Sunshine;" the bottom, "Rainbow." The heart outlines in the remaining squares consisted of picture hearts and design hearts. If you like the layout above, the one on the left is the same, only filled with blanks to help you begin to visualize your own afghan design. Below is another possible layout. Click here to choose a Cross Stitch Alphabet. There are lots of options. Use one of these or design one of your own. You can see all the cross stitches, baby hearts and design hearts, by clicking on the "Free Charts" menu button on any page, or click here. If it's a quilt you have in mind, I recommend a wonderful site called Quilt Lovers Guide. You'll find free quilt block patterns that would work well with these cross stitch designs. Click here to learn how 30 little hearts inspired me to create my own cross stitch patterns. If you are frustrated looking for just the right cross stitch patterns, maybe you'll try designing, too! What do you do when you can't find the perfect cross stitch chart? It happens more than you'd think. or individual sale. Please do not reproduce patterns for distribution.